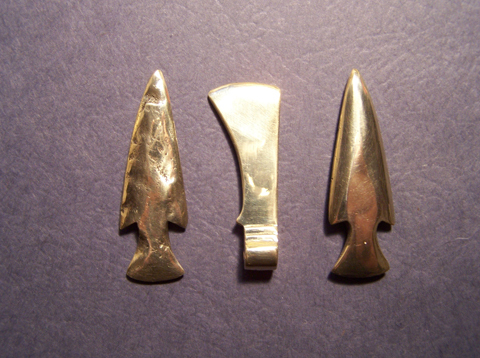 These two items, a solid brass arrow head and a small hawk head are hand cast and polished. The hawk has a hole to loop a pc. of leather or sinew through to hang around your neck. The arrow head is to be used the same way by tying a thong etc. around the small of the notch and hanging it that way. The arrow head has one smooth side for engraving and the Hawk pendant has two, we use them as prizes at Hawk and Knife throwing contest. The other side is left as it was cast from an old arrow head, this side is also polished. The size is 1 7/8" x 9/16"